The relations with Azerbaijan, as well as the implementation of the Trans-Adriatic Pipeline (TAP) project are of great importance for Albania. This remark was made by Speaker of the Albanian Parliament Ilir Meta who was received by Azerbaijani President Ilham Aliyev on October 20. The Albanian delegation led by Meta arrived in Azerbaijan with an official visit on October 19. 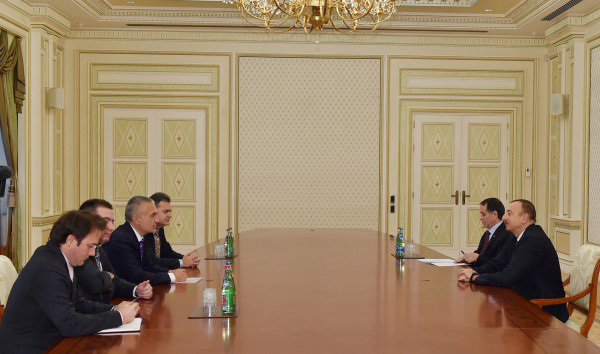 During the meeting with President Aliyev, Meta noted the implementation of the TAP project would increase Albania's regional role and open ample opportunities for the country's development. He also said the investments made by Azerbaijan in Albanian economy have contributed to the expansion of economic ties between the two countries, noting that his country is keen on enhancing economic and political relations with Azerbaijan even further. Naming Azerbaijan as a very important and reliable partner for Albania, the parliament speaker expressed confidence that bilateral ties between the two countries would continue to expand. President Aliyev, for his part, said Azerbaijan attaches great importance to bilateral ties with Albania, and expressed his satisfaction with the level of cooperation between the two countries. Noting that Azerbaijan is actively investing in Europe, Asia, as well as the Balkans region, President Aliyev said it is possible to look through additional opportunities for making further investments in various sectors of Albanian economy, as well as energy and construction sectors. President Aliyev went on noting that the TAP project would be fruitful for all participating countries, and contribute to the development of economy of both transit and consumer countries. As part of the Baku visit, the Albanian delegation also met with Prime Minister Artur Rasizade, who hailed political relations between the two countries. The sides stressed the importance of developing economic cooperation and strengthening efforts to increase trade between the two countries. Later, Azerbaijan and Albania explored ways of developing cooperation between the legislative bodies of the two countries. The discussions were held at a meeting of Parliamentary Speaker Ogtay Asadov and his Albanian counterpart. "We have friendship groups at the parliaments, and our parliamentarians share common views in international organizations. And this is a vivid evidence of the development of relations," Asadov said. He also expressed confidence that the implemented energy projects will push the development of economic relations between Azerbaijan and Albania. Meta, for his part, underlined the existing capacity for expanding economic relations and stressed the importance of developing humanitarian cooperation between the two countries. Albania recognized Azerbaijan's independence in January 1992, and diplomatic relations between the two countries were established in September 1992. The energy dimension of bilateral economic cooperation is considered as one of the most important ones. Selection of TAP as a route to deliver Azerbaijani gas to the European countries also creates enormous opportunities for bilateral cooperation between the two countries in the economic field. Albania looks forward to active involvement of Azerbaijan's state energy company SOCAR in the process of gas supply and development of gas infrastructure and gas markets in this country. Albania also attaches great importance to attraction of direct investment from Azerbaijan in energy, infrastructure, food production, tourism and other sectors of economy.